These star-ratings reflect how PSB albums compare to each other—not how they compare to albums by other artists. Remember than an "average" (three-star) PSB album is, at least as far as I'm concerned, an excellent album by pop/rock standards in general. The Boys have likened Nightlife to one of Frank Sinatra's concept albums from the 1950s, in which all of the songs concerned a central theme, such as In the Wee Small Hours. Obviously, the central theme of Nightlife is the night. All of the songs either take place at night or deal with nighttime in one way or another. Another underlying concept is aural in nature: Neil and Chris were striving for a particular "sound" on this album, one in which orchestral strings are closely integrated with synthesizers, sequencers, samplers, and other staples of "techno" music. 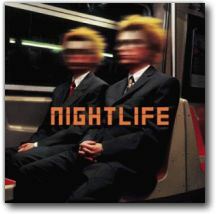 Like Bilingual before it, Nightlife was released in two editions, with the "Special Edition" enhanced with a second disc that included several remixes and b-sides. Unlike the previous album, however, the Nightlife special edition was released only in the United States—a surprising bonus for the Boys' American fans.